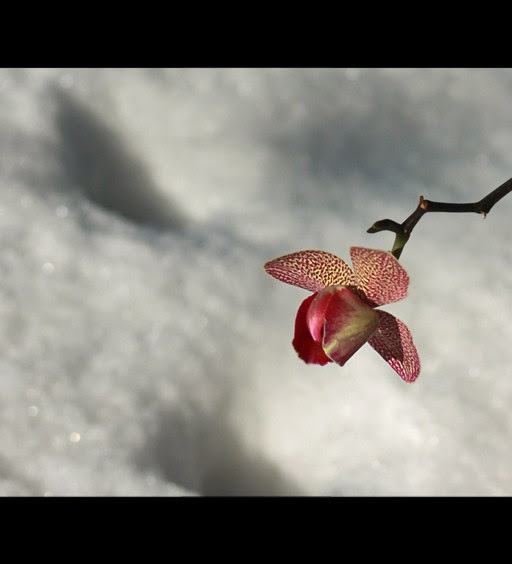 My orchid bloomed on New Year’s Eve. I noticed it as I was voicing confusion and frustration to my Beloved. While I was complaining, for that is usually what we are doing when we are amidst the throws of doubt and frustration, the Universe had already provided me with a reminder of what is ahead. New Blooms. See, I have nursed my orchid for months. For months, I have watered her and made sure that she had a spot she likes in the room. For months, I have given her attention although there were no signs of flowering. In fact, sometimes I began to feel bored with her presence as she kept the same big floppy green leaves, when I bought her with the desire of having her bright flowers add color to the room. I yearned for the beautiful oddly shaped flowers to come back as they had since browned and fallen off the limb only months after acquiring her. Now, the leaves only remained to greet me at the start and end of each day. And although her leaves were still a bright green, they were not the color pop I initially wanted to enjoy every day. So the monotony of our interaction continued. Then one day I noticed that a stem was finally peaking up around one of the leaves. Yet it would still be several weeks, over a month in fact, before I would see the small buds that teased of the arrival of new beautiful blooms. So again, I continued my routine as the buds did grow bigger, but at an agonizingly gradual and slow pace; so slowly that the idea of seeing a flower was pushed to the background of my mind. I attended to her, but stopped watching her. My expectation was released while my diligence and persistence remained. 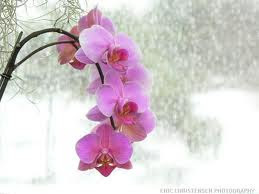 Tending to my orchid became more of a chore – nurturing her became another task that needed to be done. Thus, I created room for to water and prune her every Friday. I enjoyed giving her my attention while amidst our Friday rendezvous, but quickly refocused my efforts to other tasks once my chore was complete. This became our rhythm at least once a week for the next 3 months. And then today, while searching for the words to express feelings of disappointment about the current mundane rhythm of my love relationship, I looked over and there she was – the first bloom in over 9 months. A brilliant bright fuchsia, my favorite color, standing strong in the morning light. How long she had been there? I don’t know. When did she first opened up? I don’t know. Yet there she was. And right on time. In that very moment, looking at her beautiful bloom reminded me of the truth that “we can’t hurry love”. For often in relationship; be it our friend, our partner, our lover, our child, or our coworker – we are called to be of service to the other. To help nurture them, attend to them and release the outcome of what we expect to bloom in return. While amidst this journey, it is natural for the brightness to dim. For the bright colors to fade to brown. For the blooms to fall leaving only a browning stem to remain amongst a sea of green leaves. And during these junctures, we have to choose. Will we remain persistent in our routine to nurture and fed the new life brewing beyond our visible sight? Or do we continue with our chore, practicing willingness and persistence, sharing our energy with another while still tending to our own individual needs? There is no right or wrong here. For one can easily, release the chore and invest in a new relationship like purchasing a new plant already in full bloom, and begin again. Or one can continue to invest in the existing relationship in anticipation of the next blooming. It can be a tough choice which often triggers emotional discomfort within us all. Yet, when desiring a long lasting partnership, when wanting depth within a connection to another living spirit, there may very well only be one choice. For when choosing to journey with another, we are choosing to endure the cycle of seasonal changes that are necessary to enjoy the blooming. Thus if we embrace the monotonous chore of weekly pruning and watering, even after the flowers have fallen; and do so willingly, diligently and persistently, we just very well may awaken one day to realize that our efforts were not in vain. For while amidst fulfilling our own needs, there may come a day when we question the way forward. At that very moment when we are asking “what’s in it for me”, we may be gifted by the presence of one unexpected yet beautiful bloom that points the way. Ironically, it is the same bloom that has been nurtured and birthed by our own energy and diligence. Thus, I invite us to celebrate all the New Blooms that our previous labors have inspired!!! Be Light! !